Forgotten Bookmarks: Works of Byron - Contest has ended. I love to rescue books like these. My folks are visiting me at the moment here in the North Highlands; after this they're going to visit my mum's cousin, who lives in Aberdeenshire at the Gallowhill of Gight — right next to the ruins of the castle where Byron spent the early years of his life, and, they tell me, was first corrupted by his nurse-maid! I figure that, tangentially, makes my comment relevant. And the books look beautiful! What, no bookmarks in them? Looks sooo cool! I'm in. Ooh, awesome give-away. I'll comment to enter, absolutely! Great giveaway, count me in!! They're pretty! I want them. Whoa! I'd love to give these books a good home. It would be amazing to own a 185 year old book! These would be the oldest set on my shelf by 1 year! Alrightythen! Can't see what the covers look like, but if I'm lucky I will. Anything like the edge, and I'll be really happy. Mr. C - they are plain leather covers, except one, which has a gold border. Love this blog, love Byron. Enter me too, please. Thankee! Please enter me! These are so beautiful! I enjoy this blog. Thanks for your work and for the opportunity to win this set of books. I should have my aunt/uncle visit your shop. & agreed, gorgeous books! I need to have my aunt/uncle stop by your shop sometime... Gorgeous books, agreed! Rough shape or not, these look wonderful. Wow! 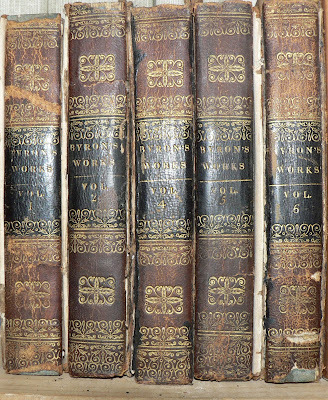 185 year old books. Even with the detached covers, they look good for their age. *g* Sure, I'd like to have them. I sent this blog to my friend who should enter this contest, but since I don't think he's checked his e-mail yet I will! Thanks for the cool blog & contest! Count me in - I'm sorely lacking in reading Byron, and what fun it would be to read them in a great old set like this one! Beautiful old books, would like to enter the contest :-) Thanks! Dare I mention how they would look on the shelf with my two similarly battered volumes of Pope (1757), or does that disqualify me? For that matter, is the Pope of any use to you? 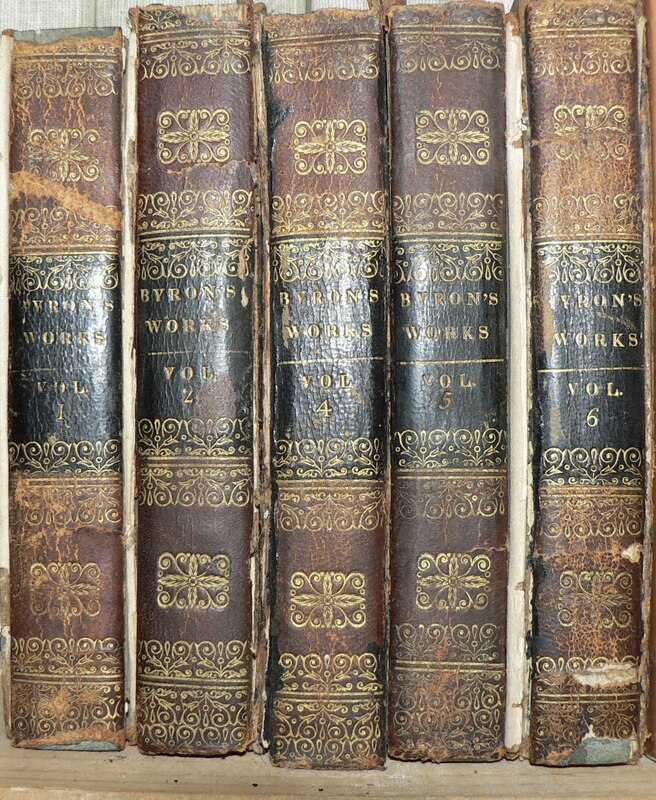 It's "The Works"—volume V, The Dunciad and other pieces, and volume IX, "Being the THIRD [volume] of his LETTERS". I would love to give these beautiful books a home. These books will look just perfect on my shelves. More beautiful for their wear. Well loved!